SaltwaterFishing 24/7 shows you, in a simple animated video, how to tie all the fishing knots you wanted to learn how to tie. Each knot has a complete description to tell you what application that knot should be used for. It doesn't matter if you looking to learn the snell knot, loop knot, Rapala Knot, or even the Jam Knot, we have all the knot tying infromation you'll need to keep your gear in tact next time you head out fishing. The Eye Crosser Knot is one of the strongest knots available when tying a hook to the end of a line. They call it the eye crosser because it can look a bit confusing while it’s being put together, but it really isn’t as hard as it appears. Watch this short animation and you will see how easy it really is to tie this knot. How to Tie the Eye Crosser Knot -- The Eye Crosser Knot is one of the strongest knots available when tying a hook to the end of a line. 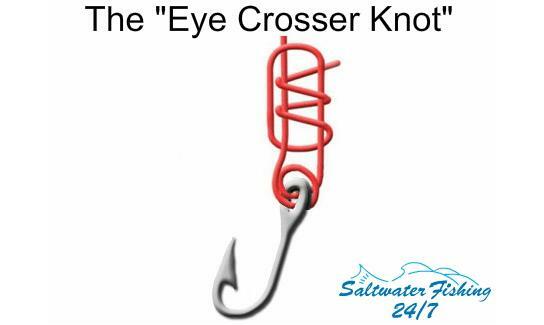 They call it the eye crosser because it can look a bit confusing to tie, but it really isn’t as hard as it appears. How to Tie a Dropper Loop Knot -- The Dropper Loop Knot creates an inline loop in a line that can be used to attach leaders, hook bait rigs and lead sinkers. Bottom fisherman like to use it because it can be used to attach a second lure or bait rig to the same line. Hot to Tie an Arbor Knot -- Based on the name alone, it’s easy to see what the arbor knot is used for. Its most practical use is to attach a fly line to the arbor, or fishing reel. It’s one of the most basic knots for an angler to learn and not very difficult to learn. How to Tie an Improved Clinch Knot -- The Clinch Knot is one of the standard knots used by anglers to secure a hook, lure or swivel to a fishing line. It has been around for a while and is one of the basic knots an angler should know when first starting out.